No Great Story Started With Someone Eating Salad? 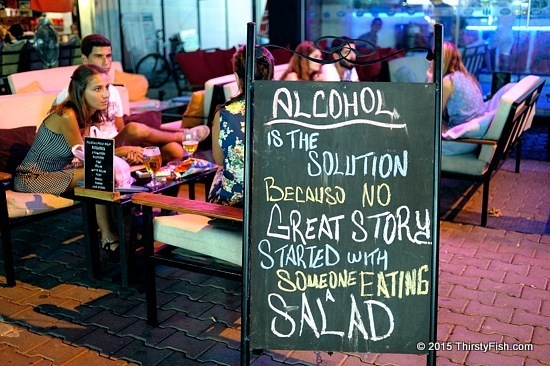 Neat Sign: "Alcohol is the solution because no great story started with someone eating a salad". Unfortunately, alcohol is not the solution. No great story ever starts with stupid people, no matter how much they drink. Some issues are way out there, not immediate, but having to deal with stupidity is almost a daily task for many less-than-stupid people. And, don't go to the Internet looking for ideas on how to deal with stupid people. If you are looking to tell a good story, avoid stupid people at all cost, that is, if you can. And, do not drink with them! Following Internet advice like "adjusting you perspective and lowering your standards", "finding humor in what stupid people do", or "overwhelming them with kindness", is just going to lead to more frustration. You have to recognize that stupidity is not one thing, stupid people are not all the same, and some smart people are (un)surprisingly stupid. Using any one metric, intelligence, understanding, reason, wit or sense, we're all relatively stupid compared to someone else. Hence, it's difficult to define stupidity. But I think Carlo M. Cipolla got it right in his essay, The Basic Laws of Human Stupidity: "A stupid person is a person who causes losses to another person, or to a group of people, while himself deriving no gain and even possibly incurring losses". There is no secret formula here. Walk away from stupidity whenever you can. Avoid it if you can. This quote by Zoe Heller summarizes it for me: "Elegance loses its power in the presence of the properly stupid". I need a drink, and a salad!